Christian Dior Addict Eau Fraiche emphasizes charm and elegance. 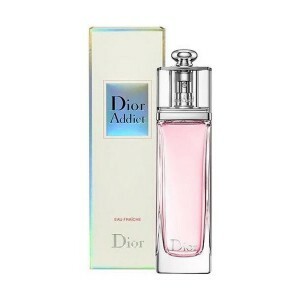 Christian Dior Addict Eau Fraiche 100ml. Eau De Toilette is an inviting, essential composition that tells the story of love and devotion. A romantic fragrance that is interwoven with fresh spicy and floral aromas. Sensual, unbounded and eccentric. So now you can also feel if you choose this scented gem. Dior Addict Eau Fraiche is a toilet water for women with a good interest in social events. The composition is the perfect fit for any event. In addition, bergamot, lily of the valley or freesia gives a very relaxing and stimulating impression. Get the male heart while you wait. The simple Dior Addict Eau Fraiche Women's Eau De Toilette Flask is a completely personal women's tribe. With its help, the inexpensive original and beneficial elixir of youth is in your fragrance collection. Get the maximum of your charm and make sure that the charm will be entirely your own. This eau de toilette is a more gentle version of Dior Addict, representing a fragrance playing in light citrus and floral notes. Meanwhile, the ease is deceptive - under the soft and gentle haze lies the frozen explosion of sensuality and the indomitable energy of freedom. A unique and noble perfume, breathtaking, is intended to give its owner - a young and optimistic girl - spring freshness all year round. Owner Addict Eau Fraiche chooses endless games with emotions and sensations, she believes only in the most beautiful and expects from the future something magical. A light floral fragrance envelops with freshness and energy, emphasizes charm and elegance, gives a wonderful mood. The perfume bottle repeats the usual shape of the bubbles representing the Addict series, however it is made of transparent glass, which conveys its lightness and purity. The Addict bottle designer also developed a flavor package that reflects light. Give yourself a little joy in the form of chic toilet water from the famous brand Dior!